When I think about desserts in the summer, I want things that are easy to make and that really showcase some bright, summertime flavors. Easy to make desserts are nice year-round, of course, but in the summer I want to spend the evenings outside enjoying the nice weather – not working in the kitchen – and I also don’t want to leave the oven on for hours when I want the house to stay cool. This Fresh Raspberry Cake is a beautiful summer dessert that hits both of these nails right on the head. 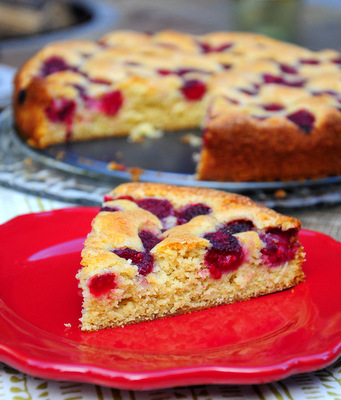 The cake is a tender, buttery cake that is packed with lots of fresh, ripe raspberries. The berries are arranged on the top of the cake before baking and the batter rises up to hold them in place as it bakes in the oven. The result is a cake that looks like it is just packed with fruit – which it is – because it almost looks like a fruit cobbler. The red raspberries give the cake gorgeous pops of color and make it look just about irresistible. The cake batter is made with buttermilk and flavored with vanilla and a hint of lemon zest. The lemon and vanilla give the cake a little depth of flavor and are a nice background to the raspberries, which are definitely the star here. I always use fresh raspberries when making this cake because they have the best flavor when they are in season and they look the prettiest in the finished cake (as frozen berries can lose some of their shape while baking on a cake like this one). The cake needs no frosting, but a little scoop of whipped cream is a nice way to dress it up a little before serving. Preheat oven to 350F. Lightly grease a 9-inch springform pan. In a large bowl, cream together butter and sugar until light. Beat in the egg, vanilla extract and lemon zest, mixing until smooth. Blend in about 1/3 of the flour mixture, followed by half of the buttermilk. Stir in half of the remaining flour mixture, followed by the rest of the buttermilk, then add the last of the flour mixture. Stir only until everything is just combined and no streaks of dry ingredients remain. Batter will be thick. Spread batter evenly into the prepared pan. Arrange raspberries evenly over the top of the batter. 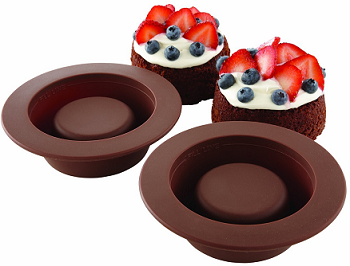 The batter will rise up around the berries as it bakes, so you don’t need to push them in. Sprinkle the cake with coarse sugar. Bake for about 45-50 minutes, or until a toothpick inserted near the center comes out with only a few moist crumbs attached. Cool completely in the pan before slicing and serving. Store leftovers in an airtight container. What an absolutely gorgeous cake. I want some of this for real. love berries and this cake look wonderful!! You must have heard me exclaiming about fresh raspberries in my patch this AM! 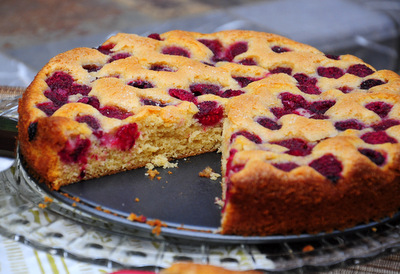 I am making a GF/DF almond cake with fresh raspberries at the moment (might even be your recipe!) but still have lots of raspberries crying to be used. I will definitely make this one for my next group though I have to say anyone would love this GF version–even if you changed to butter instead of a DF spread for the fat part. Thanks for another super idea!! 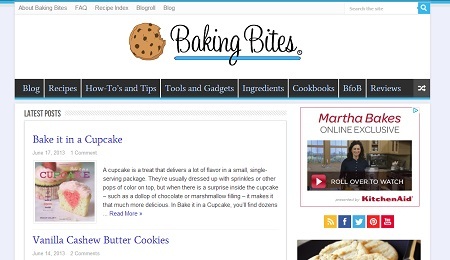 This cake looks so delicious, and I love the new look of your blog! I’ve made this cake twice and received rave reviews both times. I baked one for my librarians and when I went back two weeks later 4 of the work staff came out to tell me how great the cake was and how fast it went. I think that says a lot about the cake/recipe. I highly recommend this one to other bakers to make when you have some good fresh raspberries to use. You won’t be sorry! Question: Since this recipe uses buttermilk, why is there no baking soda in it? Linda – I’m glad to hear it! Gretchen – Just because a recipe uses buttermilk, it doesn’t mean that it automatically will include baking soda, even though baking soda is often used in recipes that contain buttermilk. For instance, many buttermilk biscuit recipes do not contain baking soda, either. In this recipe, baking powder gives a better result. If I wanted to make this cake into cupcakes, is there anything I would need to change, besides the baking time? Wow, we loved this quick and easy to make cake. So much flavor. It was tender and delicious. Super crumb. Thanks so much for sharing your recipe. Made for Think Pink Event – 2017.